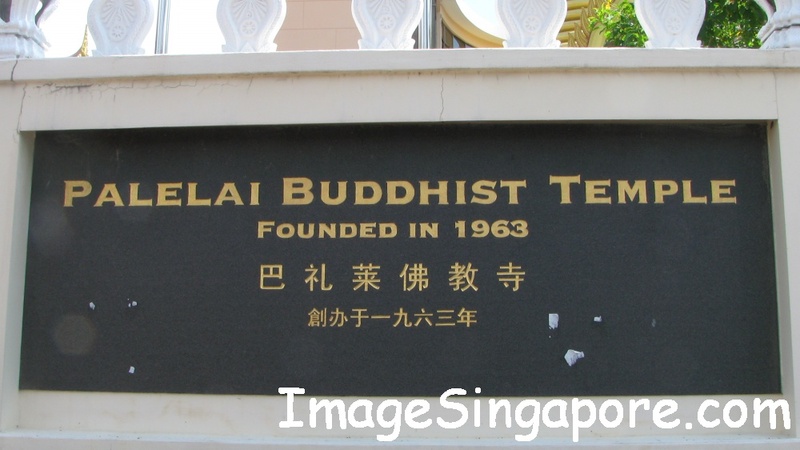 The Palelai Buddhist Temple is located at 49 Bedok Walk which is opposite the Simpang Bedok Post Office. The last time I visited this temple was more than 10 years ago; and so I have decided on a update visit on this Thai temple. I wanted to try going to this temple by using public transport to see whether it is easily accessible. I took a train and alight at Tanah Merah MRT station and thereafter took bus No. 9 and alighted at the second bus stop. Beside this bus stop are rows of shop houses which consist of mainly food outlets. I walked straight and saw the road sign ‘Bedok Walk’ and turned left and walked up the slope. 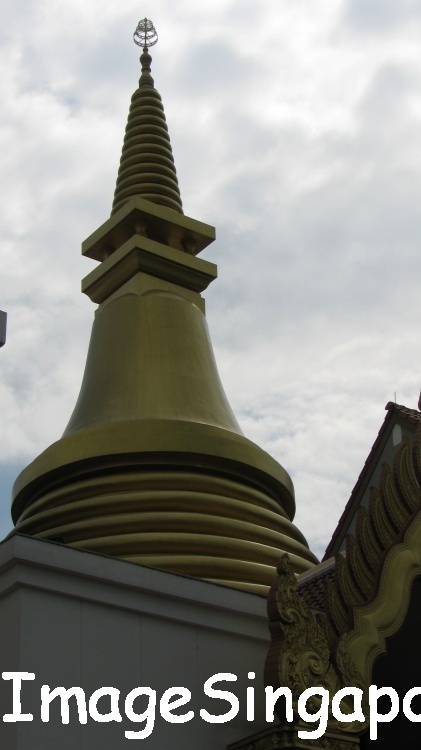 After a short walk up the slope, I saw the Palelai Buddhist temple straight ahead of me. So it is very easy to visit this temple even by using public transport. The Palelai Buddhist temple is located in a unique location – as it is surrounded by residential landed homes. I was surprised that even in a normal Thursday afternoon, there was a continuous stream of visitors coming to this temple. When I entered the main entrance, the first building that was facing me was the Arahant’s hall. 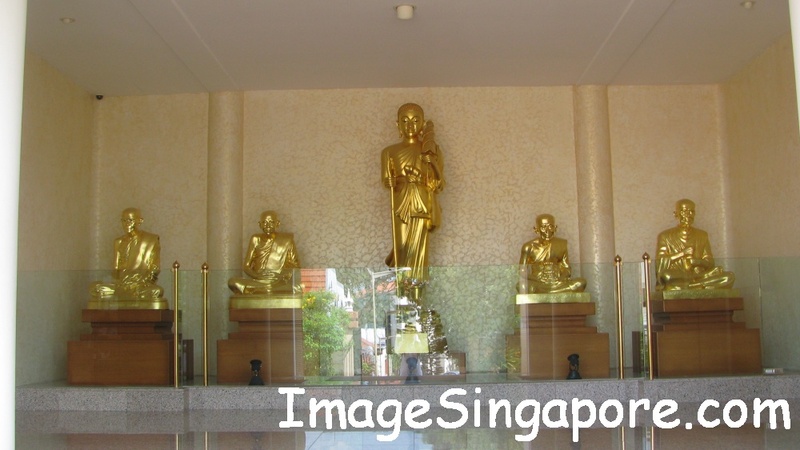 Inside the Arahant’s hall there are golden figures of monks. The word Arahant refers to someone who is pure. There are signage to inform visitors on appropriate attire for ladies and men; and also to remove your shoes before entering the temple or hall. Just outside the Arahant hall building is the Four Face Buddha Statue. I understand that the Four Face Buddha is a deity and not the Lord Budhha itself. Nevertheless, this deity is very popular as many people would pray to this Buddha for their wishes to come true. The Four Face Buddha has literally 4 faces facing four different directions. Each of the Four Face Buddha also represents a different element – The Face of Health and Peace, The Face of Prosperity and Good Fortune, the Face of a Good Relationships and the Face of Protection against harm and evils. So when I prayed to the Four Face Buddha, I am in fact seeking the blessings for all these elements. No wonder so many people from all walks of life would pray and seek the blessing from the Four Face Buddha. On the left ( from the main entrance ) is the main hall of the Palelai Buddhist Temple. 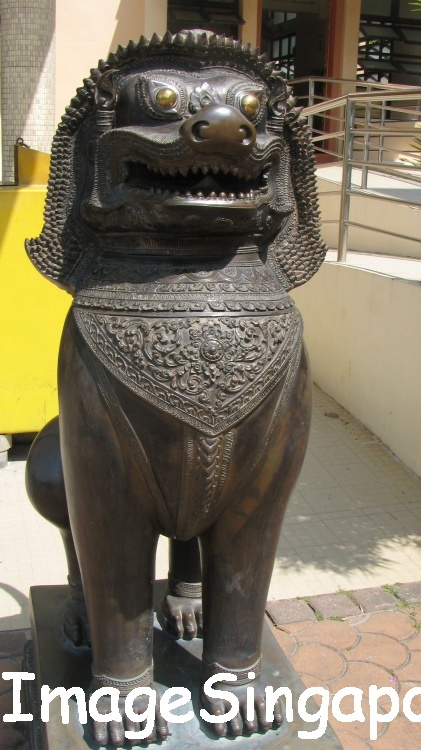 Before entering the main hall, I saw 2 large statue lions guarding the temple. 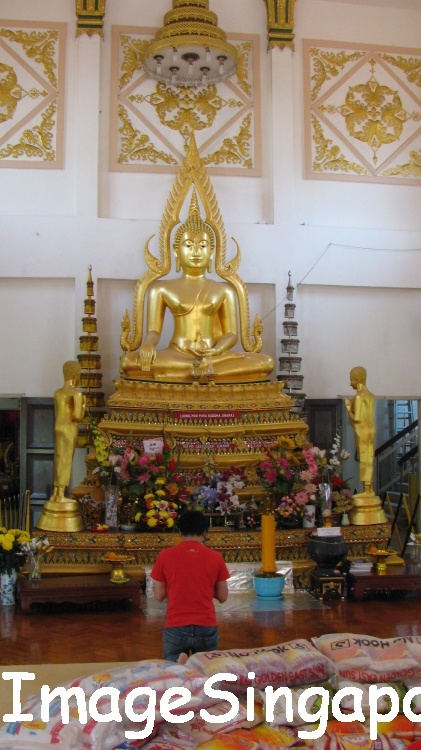 Inside the main hall, I saw a large Golden Budhha in the center and a smaller size Buddha statue on the left and right side of the hall. At that time I saw quite a number of devotees praying in the main hall. Right above the main door of the main hall, there is a large mural that hangs on top of it. 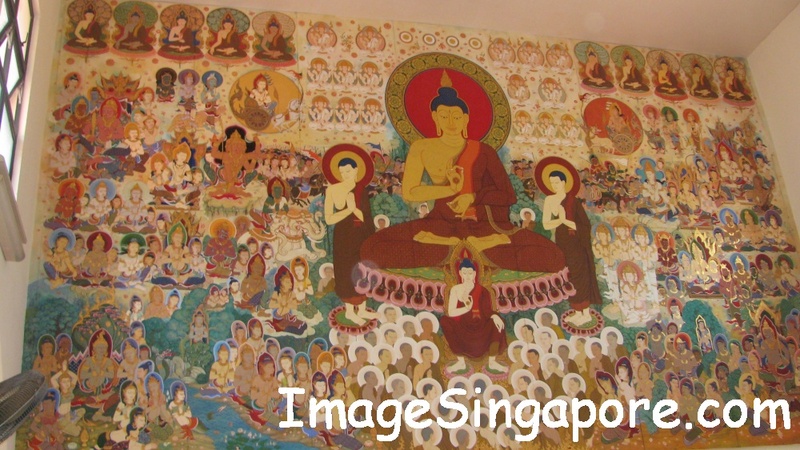 This mural depicts the many devotees coming together to pray to the Lord Buddha. There is a small entrance in the main hall that leads to the Founder’s Memorial Hall. Over there, I saw a monk sprinkling holy water and giving blessings to those devotees who were awaiting for this ceremony. 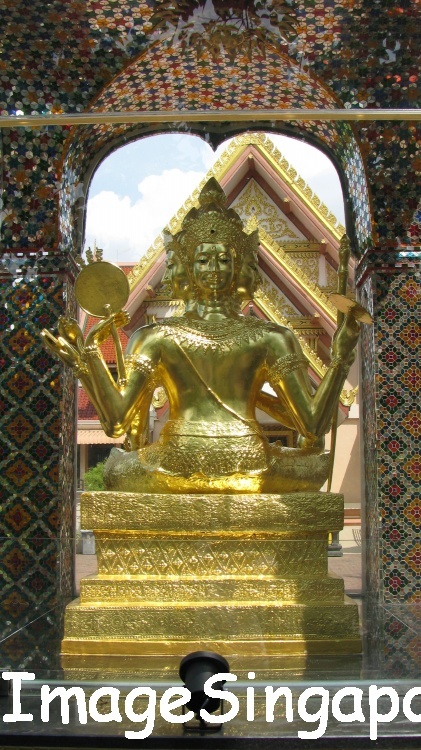 The Palelai Buddhist temple is indeed a beautiful Thai temple. It has a peaceful and relaxing atmosphere; and I get to see beautiful images of Buddha, statues of Arahant and lions, beautiful murals and the popular Four Face Buddha. I do hoped that the management of this temple could looked into putting up information board or signage, so that visitors can read and have a better understanding of this temple.